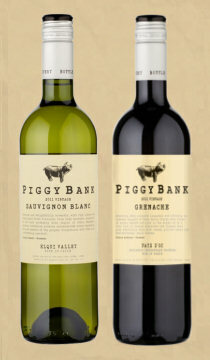 The brand new Piggy Bank range of wines – six in total – is in 160 selected Waitrose stores and Waitrose online priced at £7.99. The range has been put together by importer and brand developer, Guy Anderson wines, and 50p from every bottle will go to charity. Guy Anderson will let drinkers vote for the charity they’d prefer the money to go to via social media including the piggybankwine.com web site. The six wines come from European regions, and are made by three winemakers: Giorgio Flessati in Chile, Thierry Boudinaud in France and Scottish MW Norrel Robertson in Spain. I’m glad to say they are a very solid set of wines of excellent quality, so giving 50p to charity has never been easier or more pleasurable. This Pays d’Oc rosé has a medium cherry/salmon colour and an abundantly fruity nose suggesting ripe summer berries. There’s a little hint of briary woodland and spices, but it is focused on the fruit. On the palate it is dry, has a lip-smacking tartness of raspberry, and finishes elegantly. Lovely, food-friendly style. 86-87/100. From arguably Chile’s most exciting Sauvignon region, Elqui on the edge of the Atacama desert. Absolutely typical (and that means excellent) aromatics here of fresh, terribly delicate pea shoots and tomato leaf perfume, leading onto a palate that is zingy-fresh, with a vibrant core of acidity that is mineral and limey, scything through the precise, cool fruity flavours. Dry in the finish, this has crowd-pleasing aromatic and flavour fireworks, but a glacial cool too. 88-89/100. A lot of the Verdejo you’ll find on supermarket shelves is being made by Norrel Robertson in Castilla y Leon and Rueda in the north of Spain. This in many ways is typical, with its overtly passionfruity and elderflower aromas, which stop nicely short of becoming ‘sweaty’, as some lime-like precision comes through. On the palate it is dry and bursting with flavour, all centred around cool apple fruit, any threat of moving into sweeter, more exotic territory quickly checked by a massively dry, pithy lemon core of acidity. 86-87/100. A Pays d’Oc from the Languedoc, there’s a definite hint of raspberry, kirsch and lifted violetty nuances to this crimson-coloured wine. Richly fruited and yet sappy and fresh on the palate, the sweet intensity of the Grenache fills the mid-palate, with touches of chocolate giving a richer, more substantial core, and then the finish is freshened by juicy acidity and some nicely grippy tannins. 86-87/100. From Extremadura in Spain, in the south close to the Portuguese border, this 100% Tempranillo has a vibrant colour and an intense, vinous nose with some liquorice and graphite around the solid, earthy black fruit. In the mouth it is big, juicy and strapping stuff, flooded with berry fruit, hinting at spices and tobacco, and finishing with a very nice balance of acid, fine-grained but grippy tannin and spice. 87/100. £7.99 in Waitrose now, then in Tesco from September 2012. This Syrah is also from the Elqui Valley, home of some of Chile’s coolest vineyard sites. It has a terrific nose, with real perfume of game, black pepper and grilled bacon fat layered over abundant berry fruit. Silky on the palate, there’s plenty of pleasing fruit density and sweetness here, really quite fat and juicy, with spice and a touch of chocolate adding more flesh, before a lean, tightening core of tannins and keen cherry-ish acidity pulls it together. A cracking Syrah for the money this. 89/100.